LAS VEGAS, Nev. – New Mexico State women’s basketball team was selected to finish third in the Western Athletic Conference Preseason Polls by both the coaches and the media. Sophomore Sasha Weber was also chosen as a second team selection in each poll. The polls were announced Tuesday, Oct. 15. The Aggies were selected eighth in last year’s coaches poll and ninth in the media preseason poll. 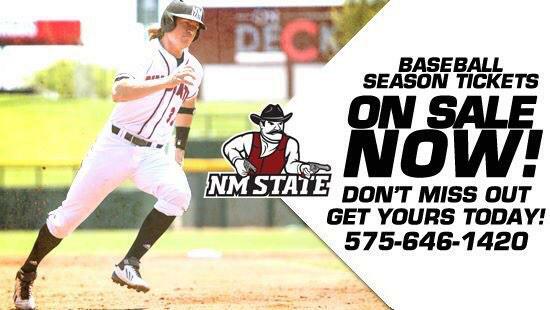 NM State finished the season with a 15-16 overall record, 7-11 in WAC, and had senior Stefanie Gilbreath labeled as the 2013 Newcomer of the Year and a second team all-conference selection. In the media poll, Seattle U is predicted to finish atop the conference with 115 points and 11 first-place votes, while Idaho received one first-place vote and sits second in the poll with 100 points. Utah Valley (75) is fourth in the poll and Bakersfield (66) rounds out the top five. Kansas City (UMKC) was selected sixth with 53 points, Texas-Pan American (40) was seventh with Grand Canyon (38) and Chicago State (18) being picked eighth and ninth. GCU received one first-place vote. Kacie Sowell of Seattle U was the Preseason Player of the Year selection and was selected as a first-team member on both polls. Joining Sowell on the All-WAC first team coaches poll is Alyssa Charlston (Idaho), Judy Jones (Grand Canyon), Eilise O’Connor (Kansas City) and Sylvia Shephard (Seattle U). Weber sits alongside Janae Coffee (Bakersfield), Tina Doughty (Utah Valley), Stacey Barr (Idaho) and Tyonna Outland (Bakersfield) on the Preseason Media All-WAC second team. In the coaches poll, Seattle U had 62 points and six first-place votes, while Idaho was second on the poll with three first-place votes and 59 points. NM State received 47 points for third, Kansas City (36) was fourth, Bakersfield (32) in fifth, Utah Valley (30) was sixth, UTPA (25) was selected seventh and GCU (23) and Chicago (10) State finished in eighth and ninth, respectively. Stacey Barr (Idaho) made her way onto the first-team of the coaches poll, along with Alyssa Charlston (Idaho), Eilise O’Connor (Kansas City), Sylvia Shephard (Seattle U) and Kacie Sowell (Seattle U). Weber (NM State), Janae Coffee (Bakersfield), Judy Jones (Grand Canyon), Kim Nezianya (Kansas City) and Ashley Ward (Seattle U) were second team selections. The Aggies season opens with an exhibition game on Nov. 2 against Western New Mexico in the Pan American Center at 6 p.m. The regular season tips off at UTEP on Nov. 12, at 7:05 p.m.